The newly updated Fort St. John Official Community Plan (adopted August 2018) states that we “will be a flourishing community where nature lives, businesses prosper, families are active and diversity is celebrated”. I believe that a revitalized downtown is essential to that overall vision for our community. A successful downtown is one of a community’s most important features. It is so much more than the shops and restaurants that are located in the downtown. It is about creating a space for people young and old to live, to work, play, to connect, to learn, and to grow. We need a downtown that people go to rather than simply drive through – a place to meet for coffee, a place to gather as a community for special arts and cultural events, a place to walk and sit outside, not only during the months of summer, but all year round. The City recognizes the potential economic and social impact that an energized downtown can have, and has made it a priority in our planning. At the same time, the City has not simply imposed a specific plan on residents and tax payers. We have established a Downtown Action Team with representation from as wide a spectrum as possible, in order that all viewpoints and perspectives are heard and understood. The City has employed the services of a consulting firm who have vast experience and expertise in this type of planning. From the initial stages of this conversation, we have very purposefully invited and included the community in the discussions and brainstorming sessions. We asked residents to share ideas and help to identify the most important opportunities and challenges for downtown. These ideas have been used inform the various concepts and options. None of these ideas are set in stone. They are just that – ideas. The options that have been presented to the community thus far simply to cast a vision and describe what Downtown could be like in the future, and they serve to highlight important choices we need to make. We continue to encourage community members to speak up and share their ideas and positive feedback as we work together to revitalize our downtown. Although the City has worked to get the ball rolling, this vision and initiative needs to be owned by each of us. This is not an ‘us’ verses ‘them’ endeavour. We need to look beyond our own personal interests and preferences and work together for the good of the entire community. We must catch the vision of what our downtown could become, and how that would affect the larger community. And we all need to bring our energy and positive input to work together for the benefit of the entire community. I believe that establishing a Business Improvement Area in our downtown is a vital piece of moving this initiative forward – having the long-term vision and plans driven and supported primarily by the ones who are affected the most - our downtown businesses. The revitalization of downtown will bring economic growth by attracting new business and development to our downtown core. As we take manageable and affordable steps towards an energized downtown, the new business climate and activity will generate more interest and investment in the downtown, and that, in turn, will pay for much of the ongoing improvements. And it becomes a positive forward-moving force – a snowball effect - development stimulating more development, energy creating more energy! An energized downtown will assist in our efforts to attract and retain a skilled workforce, including doctors, nurses, and other professionals. It has the potential to act as a hub of residential, retail, restaurants, entertainment, arts, and cultural activity, which is attractive to individuals and families considering a move to the City. Often the amenities of a community like arts, culture, entertainment, and coffee shops are as significant as anything else, when considering relocating to a new community. As we work to promote health and safety in our community, a downtown where people live, and gather, and spend time will help, as the positive behaviour and perspective demonstrated by those who spend time downtown will create a new culture and affect the overall wellness of our city center. Our health as a community will also be impacted in that we will strategically position ourselves for future growth by using land and infrastructure more efficiently, encouraging walking and transit, and supporting other community wide sustainability goals. Our downtown is key to improving the quality and livability of our community for current and future residents. This is not a short-term project. It will take several years to see the transformation of our downtown. Meanwhile, we cannot sacrifice our level of service to the community by investing too heavily in this project, to the detriment of the other equally important projects and services such as road construction, infrastructure maintenance, community development, parks and recreation services, etc. Stay tuned! 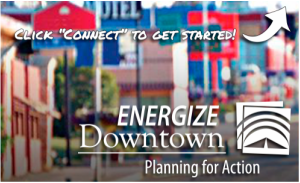 Energize Downtown will soon begin to identify a range of development, design concepts, and priorities for both public and private realms. This will form the foundation for development tools and incentives, downtown design guidelines and standards, and detailed policies for action. I would encourage the community to stay tuned, stay informed, stay engaged. Let’s work together to create this roadmap to revitalize and enhance our downtown as the heart of the community, to create a safe, inviting, attractive, and livable downtown.